Radiesse dermal filler is the ideal choice for total facial contouring or to simply minimize individual wrinkles, such as the nasolabial folds. 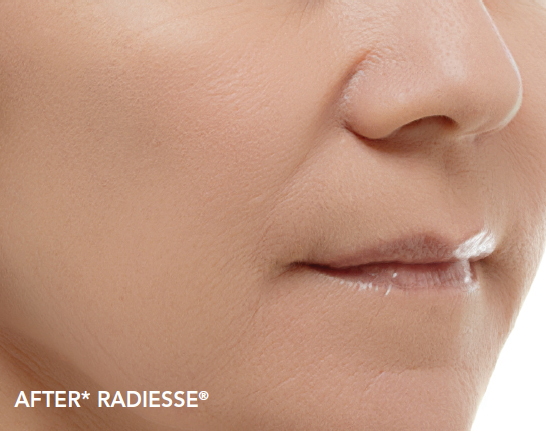 Lasting approximately a year, Radiesse has favorable longevity compared to other fillers. Radiesse is made of calcium-based microspheres suspended in a water-based gel, which is injected into the skin through a simple and minimally invasive procedure. Radiesse can restore a healthy, youthful appearance, enhance your existing features, help you defy age and gravity, and increase your confidence – all without invasive surgery or scarring. Radiesse works with your own body in a remarkable way. Upon injection, it immediately adds volume to safely contour, correct, and beautify facial features. In addition, Radiesse continues to work over time. With its patented microsphere technology, it starts a process called collagenesis, stimulating your body to produce new collagen and encouraging collagen to grow around the injection area. Radiesse actually helps your body create its own naturally younger look, setting a new standard in facial contouring and augmentation. Treatment with Radiesse at The Woodruff Institute is so simple and convenient that it can be performed during a lunch hour. You’ll see the results right away – and these results may last up to a year or more for many patients. Full cheeks situated high on the cheek bne are a classic sign of a youthful face. 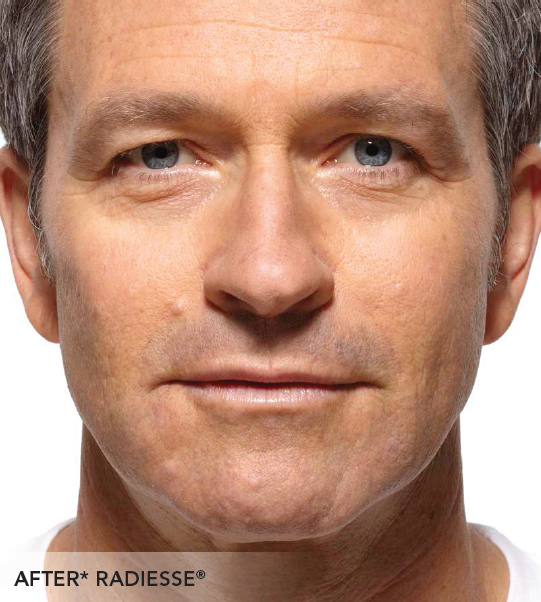 As we age and our cheek drops, volume is lost in the middle of the cheek that makes our face look gaunt and tired. Lasting a year, Radiesse can restore a full high cheek and create a fresh youthful look to the face. The technique of using Radiesse injections to rejuvenate the face is called a Liquid Facelift as Radiesse is a liquid when injected and lifts the skin as it restores the cheek bone and plumps the cheeks. 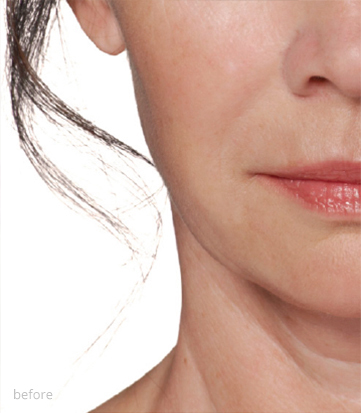 For some patients, after using Radiesse to provide a Liquid Facelift, it is not necessary to place the filler into the nasal labial fold as has been done in the past. Using Radiesse to provide a Liquid Facelift requires experience skill and knowledge of the technique. Our Facial Plastic Surgeon, Dr. Jonathan Sonne, places Radiesse strategically to achieve a more youthfully proportioned face. Treatment with Radiesse at The Woodruff Institute is so simple and convenient that it can be performed during a lunch hour. You’ll see the results right away – and these results may last up to a year or more for many patients. 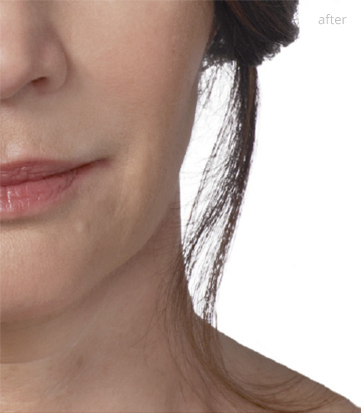 Images courtesy of Merz Aesthetics, Inc.
Radiesse, is a non-surgical injectable product that can fill in facial folds and lines and increase volume in the face. 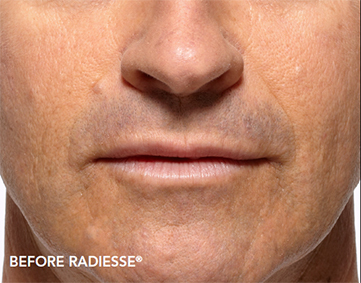 Radiesse is commonly used to improve the appearance of nasolabial folds and marionette lines and to augment the chin and cheeks. Radiesse is also popular for treatment of the dark circles beneath the eyes. Radiesse has the potential for a long-lasting effect with studies showing results lasting in excess of a year. As such, patients who are treated with Radiesse often return yearly for repeat treatment. Radiesse consists of calcium hydroxyl apatite (CaHA) suspended in gel (carboxymethylcellulose). Calcium hydroxy apatite is a normal constituent of bone and, as such, doesn’t not elicit a chronic inflammatory or immune response or require allergy testing. CaHA has been used in prosthetic implants for dental, facial and orthopedic surgery for humans for many years. The goal of all dermal filler treatments is to correct facial wrinkles and fill hollows that occur as a result of aging, weight loss, scarring, or injury. 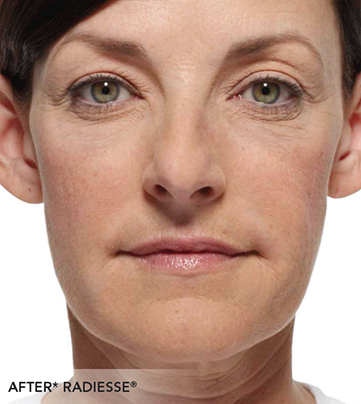 Composite fillers are one attempt to solve a major shortcoming of dermal fillers: short-lived results. Most dermal fillers last about 4-6 months. In an attempt to increase the length of results, composite fillers, such as Radiesse combine a smooth carrier gel with tiny spheres of a durable material that is designed to increase the life of results. After injection, the gel is absorbed by the body, leaving the microspheres. As it absorbs the gel, the body fills in around the spheres with collagen, maintaining results as long as the spheres are in place. These fillers are good for nasolabial folds and deep hollows. Sometimes they are used for facial reshaping. 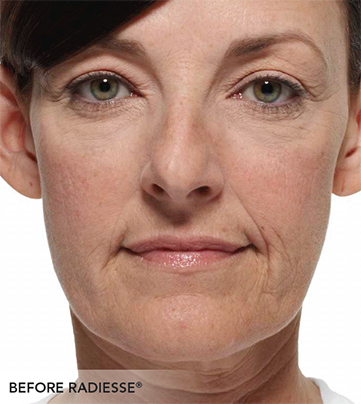 Radiesse treatments for increasing the prominence of cheekbones are popular. 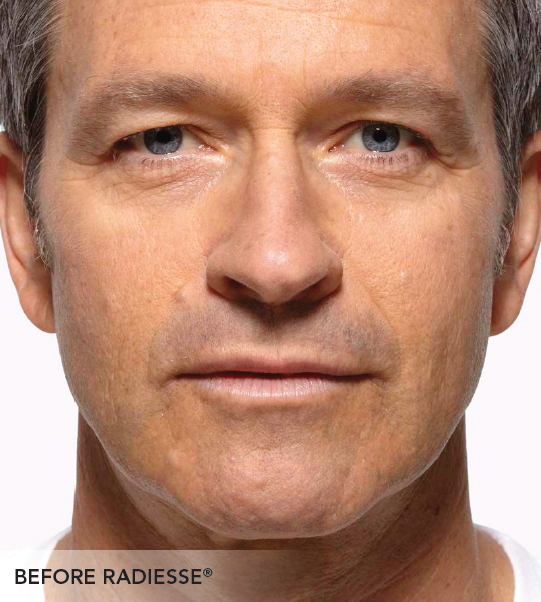 Men and women who are physically healthy, realistic in their expectations and looking to improve the appearance of the facial skin or augment the lips may be good candidates for Radiesse injections. What happens during a consultation for Radiesse? During a consultation for Radiesse, you will have a one-on-one discussion with the physician about your goals. Your face will be examined, your medical history taken and your options discussed. All aspects of the Radiesse procedure will be explained including the technique, the facility, the anesthesia, the recovery, the costs and the risks. Is anesthesia used during the Radiesse injection? At The Woodruff Institute, minimizing discomfort is a priority. Most patients find that a topical numbing cream helps keep discomfort to a minimum. Our physicians also mix numbing medicine in the syringe of Radiesse, and thus, is numbing the skin while filling wrinkles. Nerve blocks are also used if patients prefer this type of numbing. How is the actual Radiesse injection performed? A local or topical anesthetic may first be administered. The skin is cleansed and then a very fine needle is used to inject the Radiesse beneath the skin. How long does a Radiesse procedure take to perform? The Radiesse procedure is a quick one taking approximately 10 minutes to complete. Is there any pain during the Radiesse procedure? Some mild discomfort or tenderness can occur, though this typically fades quickly. What is the recovery like after the Radiesse injection? 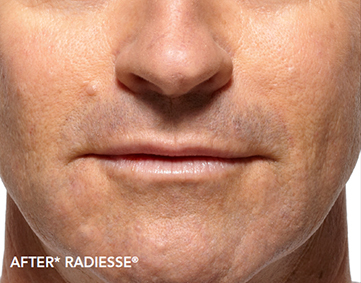 Though recovery will vary from patient to patient, it is generally minimal after Radiesse treatment. Some mild swelling or redness may occur, though this typically fades within the first day or two. Most patients can return to their normal activities immediately after treatment. Will I need to take time off from work after my Radiesse treatment? Patients are usually able to return to work and other normal activities immediately after treatment. Some patients will experience bruising, so treatment with fillers should be avoided in the days before an event that will put you in the public eye. Are there any risks or complications associated with Radiesse injections? There are few complications associated with Radiesse injections though side effects can occur and may include swelling, redness, edema, pain, itching, discoloration or tenderness. Lumpiness can occur when used in the lips, and because of this, we do not recommend Radiesse filling the lips. How long do the results of Radiesse last? 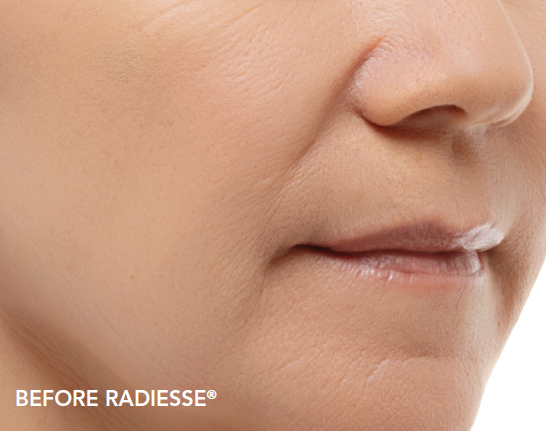 Radiesse has the potential for long-last resulting, much longer than with other fillers. Though the duration of results will vary, studies have shown results lasting longer than a year.